The last and (some say) greatest work by Edward Burne-Jones, The Sleep of Arthur in Avalon (detail shown below), has returned to the UK from Ponce, Puerto Rico, for the first time in 40 years. This enormous painting, measuring over six metres in width, is on loan to Tate Britain through March 2009, along with Frederic Leighton’s masterpiece Flaming June (1895), from the Museo de Arte de Ponce while its galleries undergo renovation. These important paintings will be shown alongside other masterpieces of late-Victorian art from the Tate Collection. Following the artist’s death the painting passed to a neighbour of Burne-Jones’s whose descendants, John and Penryn Monck, sold the work at Christie’s in April 1963 to Don Luis Ferré, Puerto Rico's governor and founder of the Museo de Arte de Ponce. Even at a time when Victorian art was unfashionable, the sale was considered a significant loss to Britain. 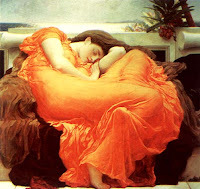 Flaming June (shown at left) by Leighton (DNB bio here; Wiki bio here) was last on display in the UK in 1996. It's one of the artist’s final works and shows a woman as she sleeps in the heat of the Mediterranean sun. 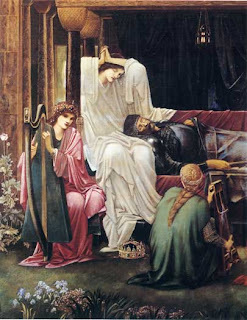 The themes of sleep, death, and unconsciousness were important to both Burne-Jones and Leighton. Great post! Did you know that Andrew Lloyd Webber almost bought the original Flaming June for 50 pounds from a London shop when he was a kid? His grandmother thought it was Victorian junk and wouldn't give hime the money! Big mistake!